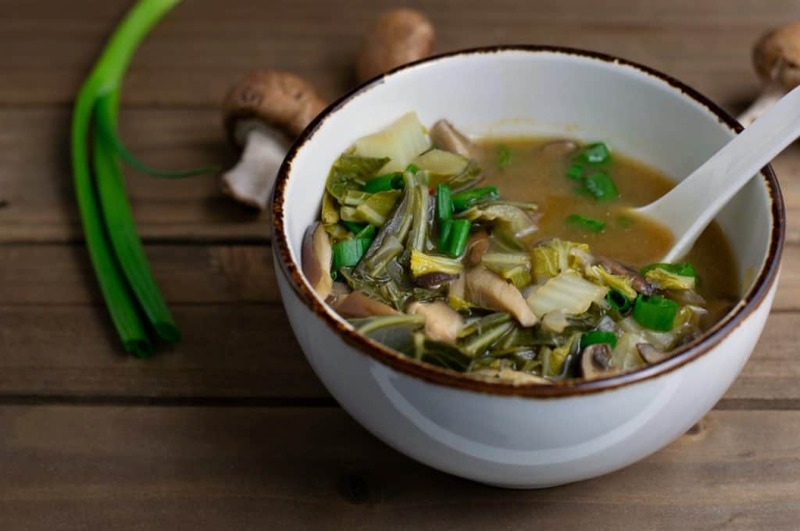 Healthy also means delicious in this super easy-to-make Vegan Mushroom Bok Choy Soup. Who knew just a handful of ingredients could taste so good? 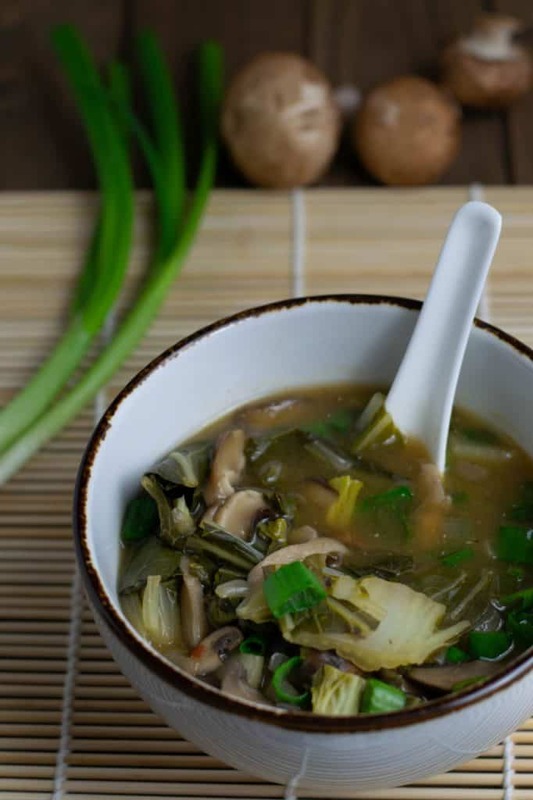 The 3 main ingredients in this soup are Shiitake Mushrooms, Portobello Mushrooms, and fresh Chinese Bok Choy – readily available in most supermarkets. Shiitake Mushrooms are an edible mushroom native to East Asia. Because of their health benefits, they have been mentioned in books for thousands of years and are considered to be medicinal mushrooms in traditional herbal medicine. They are packed with B vitamins and have the power to fight cancer cells, cardiovascular disease and infections. Plus, they also have antiviral, antibacterial and antifungal properties, help to control blood sugar, and reduce inflammation within the body. All of these health benefits …..just from eating a mushroom. Portobellos have quickly risen to be the primary “meat replacer” in my home. Not only do they have a meat-like taste and texture, but they are also a good source of plant-based protein. Low in saturated fat and cholesterol and high in fiber, Portobellos are an excellent source of copper, which your body needs to produce red blood cells and carry oxygen through your body. And, a single Portobello contains more potassium than a banana – 630 mg per serving – which is great for helping to control blood pressure. First of all, here’s a fun fact: The name “bok choy” originated from the Chinese word for “soup spoon” because of the shape of its leaves. Cultivated in China for centuries, bok choy is a deep, green leafy vegetable that resembles Romaine lettuce on top and celery on the bottom, and is closely related to cabbage. Not only is it tasty to eat, it has also played a huge role in traditional Chinese Medicine due to its many health benefits. Fresh Bok Choy provides an insanely high level of vitamin A and C per serving. A one-cup serving provides 140 percent of your RDA of vitamin A and over 75 percent of vitamin C.
Then, of course, there are the antioxidants, an impressive number of phytonutrients, and an abundance of minerals like iron, calcium, manganese and folate…. This simple little cabbage can benefit almost every system in the body. 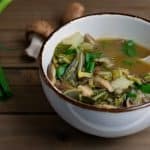 Put them all together with a little vegetable-based broth and you have a super-healthy soup, that also happens to taste amazing. Start my dicing a small onion and adding it to a large soup pan. To keep it from sticking, you can add a tablespoon or two of water or veg broth. Saute until it begins to soften and then we’ll add the mushrooms. Remove any stems from your mushrooms and give them a quick rinse to remove any dirt or debris. Then slice about 1/2 pound of Shiitake Mushrooms, and 1/2 pound of Portobello Mushrooms and add to your pan. As the mushrooms begin to cook they will release their own liquid so there’s no need to add any additional water or broth yet. Simmer until they begin to soften and while they’re cooking we can chop our Bok Choy. Bok Choy comes in many sizes from very large stalks to the “Baby Bok Choy” stalks I saw in my grocery store. I picked 2 medium sized Bok Choys and that was plenty. You can always add more for a thicker soup, – up to you. Cut off about 1/2″ of the end of the stalk and then rinse the leaves under running water to remove any dirt or grime. Then chop each leave into bite-sized pieces. You mushrooms should be softening by now, so I always like to add a little Low Sodium Soy Sauce to mine to give them an even more ‘unami‘ or ‘meaty‘ taste. Just a couple of tablospoons will do. 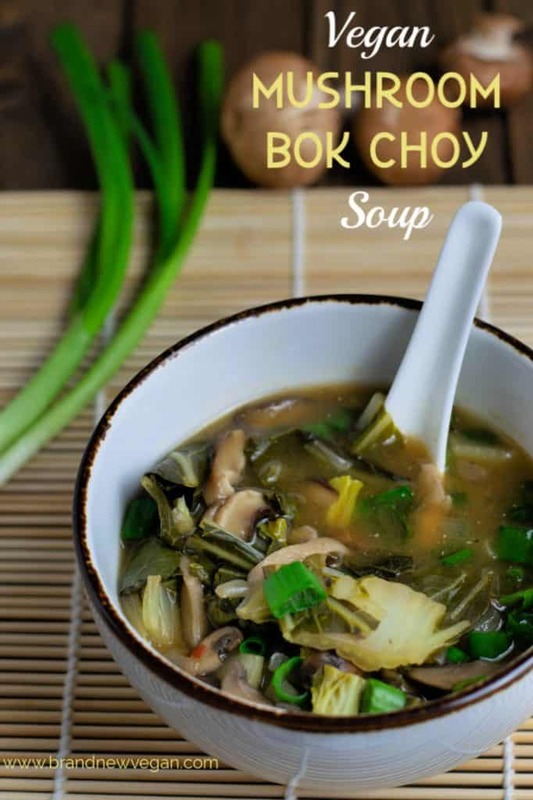 Finally, we add the Bok Choy and an entire carton (4 cups) of Low Sodium Vegetable Broth. Bring your heat up to high, and as soon as the soup begins to boil – turn down the heat to low and cover with a lid. Let your soup simmer on low-heat for about 15-20 minutes. Right before serving is when I like to season. A few grinds of black pepper, a dash of kosher salt, and 1 tablespoon of White Miso. Miso is a fermented soybean paste and is available in many grocery stores now. It adds that savory or what they call “unami” flavor to the soup. If you cannot find it, you could always add a bit more soy sauce instead or maybe another pinch of salt. But if you can find Miso – I highly recommend it. Of course if you want to spice it up, you could also add a dash of Sriracha or maybe some Asian Chile/Garlic Paste, but that it entirely up to you. And that my friends, is a very basic Asian Soup. Warm, comforting, and super healthy. I hope you enjoy it as much as we did and please leave those comments if you did. I love hearing from you. Until next week! Keep on Cookin’! Dice the onion and add it to a large soup pan over med-low heat. You can add a tablespoon of water or veg broth to prevent sticking. While the onion is cooking, clean and destem the mushrooms and slice them into thin pieces. Add them to the pan and continue to simmer over med-low heat. Cut 1/2″ to 1″ off the end of each Bok Choy plant and rinse them thoroughly. Then slice the leaves into bite-sized pieces and add to the soup pan. Add 4 cups (1 qt carton) low sodium vegetable broth and increase heat to high. Once soup begins to boil, reduce heat to low and cover. Season with salt, pepper, and 1 tablespoon of white miso before serving. Stir well to ensure the miso dissolves into the soup. Garnish with toasted sesame seeds and chopped green onion if desired. What could be healthier and so simple to make. Thank you for putting this together for me. I wonder why you say to destem the mushrooms though. Do you eat them? Few years back, on a Vipassana retreat, they would serve very similar for breakfast every day. Difference was they would take the left over brown rice from previous dinner and simmer in a lot of water, on the stove, all night, then use that as the base. Perfect way to start a cold, damp day! Van I make this with baby bella or white button? 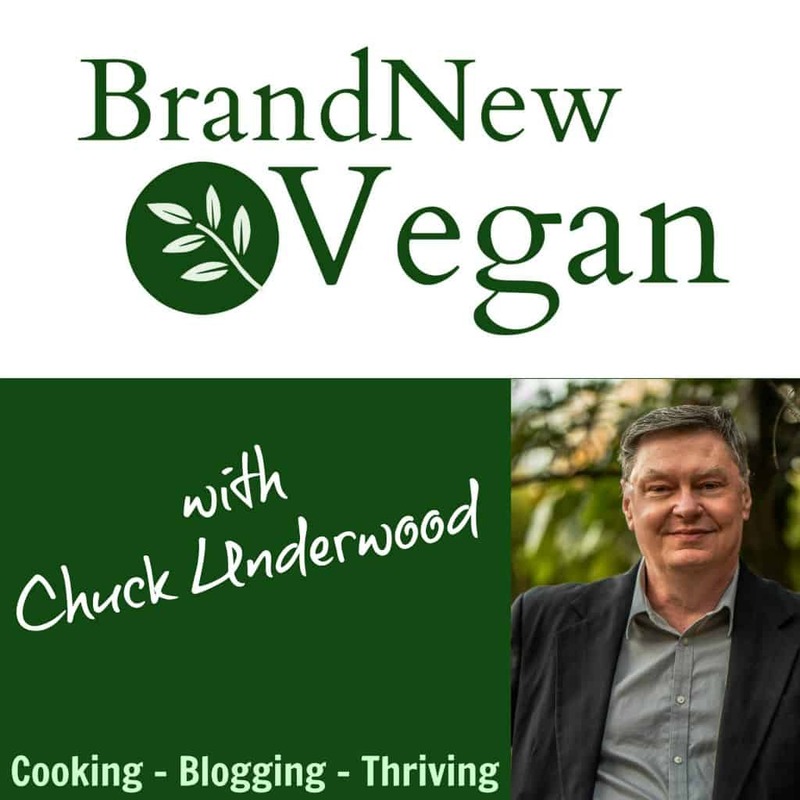 Hi Chuck – perhaps it would be good to clarify that the miso is added after the soup is cooked and pulled off the heat because miso is full of enzymes that we don’t want to destroy with high heat. I always dissolve it in soup water Taken from the soup pot and put into a separate measure until it is dissolved – then I add it back into the soup. If reheating a miso soup I am careful to warm it gently but not bring it to high heat. I made a big pot of this for tonight’s supper, – nourishing, hydrating, food for the soul! Thanks for this post! This soup looks wonderful. I love mushrooms. How big is a medium bok choy? It would be helpful to know how much you should have once it is chopped. Nice and easy! A little sriracha makes it ! This soup is and was fabulous.. Since we are doing the Mary mini I looked closely at the recipe and decided it would be ok to have with a baked potato. Was a lovely match as the wind and snow blew blustery outside. Hope it was is Mary mini compatible. I never comment, but this is a fabulous recipe. Ive made it twice and love it. Ive shared it with others and they love it too! Hey how is this the next day, I would love to prepare it for lunch!